Can National Geographic be trusted under Murdoch leadership? On Wednesday, 21st Century Fox and the National Geographic Society (NGS) announced a $725 million deal to create a new venture between the two companies. Promoted as an "expanded partnership" built upon an 18-year-old relationship with National Geographic's television presence, the 127-year-old magazine will no longer be a non-profit enterprise, but a for-profit venture. 21st Century Fox, a film and television company controlled by billionaire Rupert Murdoch whose son James Murdoch is the newly minted chief executive, will have a 73% stake in the new partnership, to be known as National Geographic Partners. NGS will control 27% and both contingents will be represented equally on the board of directors. The properties of the new National Geographic Partners include: National Geographic magazines, National Geographic Studios, related digital and social media platforms, books, maps, children’s media, and ancillary activities, according to the press release. Longtime fans of National Geographic understandably reacted to the news with consternation. For a magazine devoted to spreading knowledge of the natural world and guarding its resources, being overseen by Rupert Murdoch, who has made numerous unsubstantiated claims about global warming, does not instill confidence in the mission. After all, 21st Century Fox also controls Fox News Channel, where environmental stewardship is frowned upon as government overreach. James Murdoch tried to preemptively assuage these concerns, stating that "we are privileged to have the opportunity to expand our partnership to continue to bring to audiences around the world, ‘The world and all that is in it,’ as NGS’s second president Alexander Graham Bell stated more than a century ago." "We believe in the Society’s mission of bringing the world to audiences through science, education and exploration," Murdoch continued. NGS will continue to focus on its core mission of funding science and exploration. Alexander Graham Bell and 32 other academics, explorers, and elite members of society founded NGS in Washington, DC in 1888. It was a "diverse group of geographers, explorers, teachers, lawyers, cartographers, military officers and financiers," according to the History Channel. Bell needs little introduction—he invented the telephone. John Wesley Powell, the one-armed explorer of the American West, was also a founding member of the Society. Powell was the first person to lead an expedition down the Colorado River and through the Grand Canyon. George Melville, another founding member, was a daring Arctic adventurer who was given the Congressional Gold Medal for his feats of bravery during an Arctic voyage gone awry. These 33 men—yes they were all men—came together during a period of great natural discovery and exploration to found one of the most enduring, iconic, and successful scientific and educational undertakings of the modern era. However, with magazine sales rapidly declining and revenue sources in upheaval in this new era of digital proliferation, NGS has been forced to compromise, and to hand over ultimate control to 21st Century Fox. While this deal greatly bolsters NGS's finances, to the tune of a nearly $1 billion endowment—roughly double the current endowment—it remains to be seen how the content will be impacted, if at all. Gary Knell, CEO of NGS, will serve as the new board’s first chairman. He told USA Today that the deal "was a robust way to make sure that the society has resources for many years." "The value generated by this transaction…ensures that we will have greater resources for this work, which includes our grant-making programs that support scientists and explorers around the world," said Knell. "As media organizations work to meet the increasing demand for high-quality storytelling across multiple platforms, it’s clear that the opportunity to grow by more closely aligning our branded content and licensing assets is the right path." What can we expect from the half of the board of directors of National Geographic Partners to be represented by 21st Century Fox? Aside from James and Rupert Murdoch, the current board of directors of 21st Century Fox also includes Lachlan Murdoch, Rupert's eldest son. There's Sir Roderick Eddington, who amongst many former titles was director of Rio Tinto, the metals and mining corporation, from 2005 to 2011. There's also Jacques Nasser, current chairman of BHP Bilton, a multinational mining and petroleum company headquartered in Australia. Rio Tinto and BHP Bilton live up to NGS's mission to explore the planet and discover new resources, but not in the way the founders intended. The board of directors of 21st Century Fox has only one woman, so that is one common element of the groups that hasn't changed much since the 1800s. The current board of trustees for NGS includes people like Dr. Wanda M. Austin, CEO and president of The Aerospace Corporation, a California non-profit that provides advice on space missions. There is also Brendan Bechtel, president and COO of the Bechtel Corporation, the largest construction and civil engineering company in the United States. Bechtel Corp. is involved with the mining sector as well as fossil fuel–related infrastructure. Another commonality between the 1880s and present day: money is power. For a magazine that has managed to survive for over a century and to make a yellow box logo into an internationally recognizable icon, the jury is still out on what this century holds. National Geographic continues to produce compelling and informative content, not least of all stunning images that translate well to social media platforms. They are also pursuing ambitious projects in the form of wildlife documentaries and 3D programming. According to the Washington Post, some of the anxiety of the deal "stems from the fear of becoming an afterthought in an enterprise dominated by a shareholder, Fox, that operates a company with $29 billion in annual revenue." 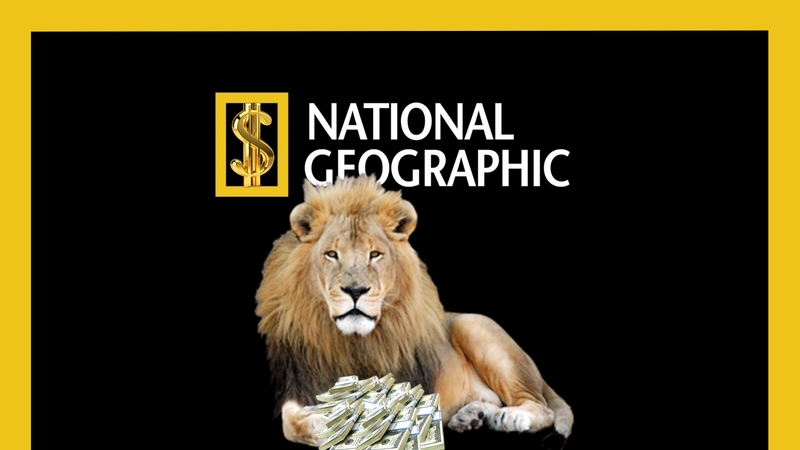 It would be a great disservice to us all if National Geographic was relegated to an afterthought.